Every once in a while in life we come across those moments in life where things change. Where we stop to reflect on where we came from and where we are headed. When we reach those decision points that will impact the direction we take our lives and push aside the things that are preventing us from being where we want to be. 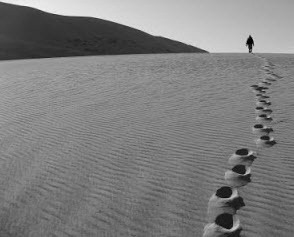 Life is a never-ending climb up the sandy hill, but we occasionally need to stop and reflect on the footprints we left behind to understand the direction from where we have come. Life contains a lot of decisions. Some are no brainers, some with little consequence or importance, some without really questioning the “why” of our choices. Other times, we make difficult decisions in life. We have to decide to change paths, to change circumstances, or to change our positions in life. It’s these types of decisions that alter our very existence and often impact those around us. When we happen upon these crossroads in life, it is generally two kinds: a path from which we are looking to flee or a path toward which we seek to embark. Sometimes, if not often, these paths are one in the same…it’s all in the perspective we choose to see our journey and the perspective we choose to take that fuels the nature of our venture. My challenge is this: relish these moments when these times come along. Some hills we climb are steeper and more difficult than others, but when we make the tough decisions to chose for ourselves a new state of being, a new beginning, or a new frame of mind we open our being to new opportunities, experiences, or adventures. There is never anything easy about shedding the past and walking in a new light, but we must remember that it’s never about the ease of our journeys, but rather the destination that matters. So what will be the fire to light our course when we push on? Courage. Determination. The thirst for something more in our life. For each of us, the passion that keeps us walking up the hill shows itself differently. Part of the experience is having the opportunity to have our own perspectives and live our journey in our own unique light. We will find commonality with the journeys that other take and will share our tales of each others trek, but ultimately our walk is not only unique to who we are but molds and fashions who we are. When we walk up the sandy hill, we leave the footprints behind to remind us the way we chose to climb. We see and remember them, sometimes we either love or hate them, we feel senses of accomplishment or disappointment with them, but ultimately we look back upon them. Those small imprints are simply reminders that you are about to make a new one in the sand right in front of you. Take the time to look back upon them and understand why or how they happened, but never forget to keep looking for the best way up that hill and journey upward. ~ by bfmooz on October 22, 2012.